"Strong project management but requires careful planning for setup"
I really love that the application can be built around your business needs. When you think of project management, it’s very specific to you and your process. You want to understand your process first before you try to build-out any workflow tool. The amazing thing about workflowmax is that you can really use it for what you’re doing and trying to accomplish. It integrates with other applications and gives you robust reporting capabilities. I can track my costs on jobs whether salary or expenses like travel. The setup is challenging in the beginning and more videos would be really helpful. The help articles could go in more depth. Especially when you’re trying to figure out process. Also, if you have a project with a lot of steps, you can’t note directly to “to-do” items under a task. However, you can apply notes to tasks. We’ve made changes since implementation and that’s normal with any big implementation of a tool. Also to send an email to a job, the job number has to be in the subject line—that can be confusing to clients. So, I usually forward afterwards. It’s also not really iPad friends, so it needs improvement there. Regular tasks work, but if there’s a pop-up for additional information, it doesn’t work. It’s a strong application, but you need to be ready to invest your time or someone else in building out properly. There’s a lot of project management platforms out there that are much easier to get started. But, with Workflowmax it will grow with you. One other might be easier to setup, but you’ll be turning around likely at some point and returning to find one that fits your needs at that time. So, if you’ve go the time and you’ve identified it will work, I think you’ll love it. We use WorkflowMax to keep up with our year-long engagements, tax return preparation, onboarding, internal jobs, and analyze our costs. It’s been amazing to have all of these data in one place. It gives me real-time notifications and I can analyze performance and deadlines. "Don't Trust the Document Management System"
Integration with Xero is really the biggest benefit... also their estimate-to-invoice system is pretty good. You can't trust their document management system to appropriately save emails to the correct folders. It duplicates, stalls and, after a month of waiting for customer support, ended up loosing several months of emails, attachments, images and documents that were supposed to be saved to job folders. Very frustrating. When we asked customer service, they didn't know why and didn't offer a solution. They aren't listening to consumers... and fixing issues. Most of their time has been put into things like "single sign on" with Xero... but even that has its issues. Interface is ok, but takes several months to setup and get used to. Also managing tasks for employees for small business is based on larger, long-term projects rather than short design projects. I wouldn't recommend it for small design agencies. "Full featured, cost effective, cloud-based job management system for professional services firms"
As certified WorkflowMax advisors we have implemented and provided support for WorkflowMax for a large number of clients across a diverse range of industries including Architects, Accounting Practices, Business Advisors, Branding Agencies, IT Management Firms, Creative Agencies, Consulting Practices, Construction Firms, Media Firms, Mobile Service and Registered Training Organisations. -	Flexible document templates allow customised branding on proposals, quotes, invoices and other documents. - Job Management and Job Document Storage, with Workflowmax the entire team is able to access the job details and documents from anywhere on any device. "Great for agency time keeping "
We are a full service marketing agency and we use Workflow for time tracking and time logging. The time sheet option is very simple and easy to use and allows us to add notes on every task completed which we later use to add task descriptions and details to client invoices. Workflow Max makes it very easy for us to know how much time we have spent on each project and client and when we have gone overtime. When time logging is done correctly this gives us invaluable information about the productivity and profitability of the agency. There is room for improvement on automating recurring projects and tasks. Very often team members are left out of a project which can cause confusion. I would love to see improvements of the personal dashboard with an overview of time spent on each client and perhaps a job list that can be rannked by priority. 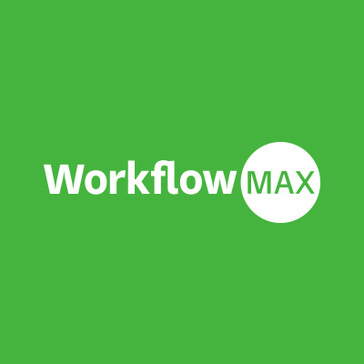 "WorkflowMax Provides An Integrated Platform for Professional Services"
WFM provides an integrated platform for professional services businesses, particularly those in design and advertising businesses where image files are produced. It is a great choice for small teams [<15 professionals] where workflows are NOT highly complex, and tools don't produce HUGE files. The workflow functionality could be substantially improved. A full set of boolean functions and concatination is lacking. The software could definitely be upgraded to handle more complex transactions. If you use Xero for accounting, WFM is a great choice. Make sure you fully understand the how the platform works before you adopt. The standardization of workflow has the potential to be a tremendous benefit to a business. The decision o use a product like this puts a substantial premium on he effectiveness of user adoption. A potential adopter would do well to consider the business transformation process he contemplate following. The use of an outside consultant to assist with the design and implementation of his product is critical to success. Executive sponsorship is also going to be important to adoption success. I would strongly recommend discussing goals with an actual user of the product to fully understand what is and isn't reasonable as a expectation of success. "We switched to another WorkFlow management system that was better"
It was easy to log time on this and it was great to manage projects and check up on your tasks. I also like that you can export it onto Excel. I would look into other platforms first. We were able to allocate the correct amount of time to the correct client. Sometimes, it can be hard to predict how much time you're spending on a client without measuring it from the start. "It has made things so much easier"
Anyone working on the assignment can easily access the document storage and collaboration very well. It would great if they could enhance the integrations bit more. It is a perfect software if you have a small or mid-sized business and cannot afford so much on things like this. WorkflowMax has almost all the features you need in a project management software. This software makes time tracking and scheduling so much easier. If you are skeptical about this software, you can sign up for a free trial with WorkflowMax. Plus don't forget to look at the help/guide as there are features that may go unnoticed. Again, the best part of this software is its ability to integrate with other programs. Workflowmax is a fantastic job mangement program that has saved APT a lot of time in book keeping. The software covers our complete workflow from Quoting and Scoping a Job, Managing the Job and Invoicing. The Stopwatch feature for time keeping adds a level of detail which makes it hard for cutomers to argue - everything is recorded in real time. WFM allows document storage and collaboration straight to the job, all emails, files and notes can be accessed by anyone working on the job - no searching for lost information. There are a few integrations that are available for WFM (eg Xero) which work really well but It would be great if WFM had Zapier integration. I liked the overall workflow of the software, including the quoting/pricing modules. They were pretty flawless and helped me make sense of a pricing system on the fly. Also, there is the intergration with Xero, which is the platform I use for accounting. The user interface, it's a calendar like app. Time tracking is a pain for most employees. We usually have work sprints, have several projects to work on every months (agency). It would be great if project managers could setup WorkflowMax easily so everyone can see jobs/projects in a simple manner. Instead of having a dropdown menu with codes that barely anyone understands. I would like to have to spend maximum 5 minutes a day on workflowMax to report my hours. WorkflowMax should be a companion and not a bargain. It's a time tracking software, I don't know if it's the best but after one year using it, I'm not convince it's the best interface to use. Tracking hours for projects cost estimations. "Effective software to help track hours"
Easy access to noting jobs and how much time was spent on them. Tracking and using an internal numbering system makes finding jobs easy on WorkflowMax. Can feel very busy at times, but that's not the UI's fault. Just a matter of how much work is being put into the program. Tracking hours of time worked. "A+ integration, not so great functionality"
Hands down, the best feature of WorkflowMax is it's integration with Xero. We use Xero as our accounting system and when looking for a project management software integration is one of the two must have features. "Everything that isn't the fact that it integrates with Xero". At the end of the day we stopped using this software because it was too simplistic. It didn't handle the intricacies that we required to properly manage and measure our projects. In a word and a half, "don't". At this point in time, unless you are a very small organization, WorkflowMax is not an appropriate tool and doesn't provide the level of sophistication required to properly manage even medium sized projects. "Workmax is an avg workflow tool not impressed"
Workmax flow nicely integrated with Xero and works okay. I do not like how it doesn’t take Client information from Xero and create basic workflow -lots of data input. "Great for timed and expense billing "
The ease of tracking , documenting and billing. Lack of Gantt project modeling and the interface iia outdated..
What's more inportant, timelines or tracking. The best features are its ability to track and juatify time spent on client needs. I find this application to not only be useful but user friendly. I use it daily at my job. I really like the fast processing of data and how easy it is to train new employees on the ins and outs of the application. In the mornings sometimes I find it slow to start up and get moving depending on the data retrieved from the night before. But that could be more of a company issue not a application issue. I use this application to schedule meetings and respond to customers and internal customers through the portal. I love the ease of use of this software! It really is a one stop shop in terms of time recording, project management, etc. If I am being honest, there is nothing I really dislike about this service. It is easy to input time and write notes. Easy to read after inputting time. It's a basic time keeping software. It's not difficult to use but takes some getting used to. It's a good tool for project management. WfM makes it way easy to have all of our info in one spot and other can easily access it. * We monitor all WorkflowMax reviews to prevent fraudulent reviews and keep review quality high. We do not post reviews by company employees or direct competitors. Validated reviews require the user to submit a screenshot of the product containing their user ID, in order to verify a user is an actual user of the product. Hi there! Are you looking to implement a solution like WorkflowMax?